5 Ways To Get Toasted | OhGizmo! Have you ever stopped to ask yourself why exactly toast tastes different from bread? I mean, it’s the same substance, just warmer and slightly burned, right? This mystery has plagued mankind for thousands (yes, thousands) of years, and only adds to the mystique of this crispy crunchy food. It is entirely understandable, therefore, that so much brainpower has been focused on the development of the toaster. After the jump, take a look at five scrumptiously innovative toasting machines. 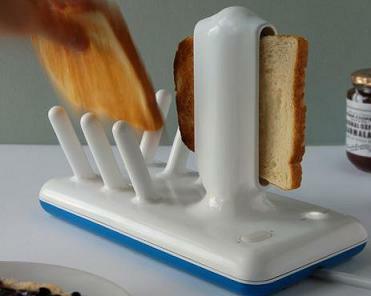 This obviously conceptual toaster offers the toast itself an entirely different experience. Perhaps your particular variety of bread doesn’t take very well to the brief down and up thrill ride of a conventional toaster and would prefer a stately, secluded, romantically lit trip through a tunnel on a toast carriage. The slower the carriage ride, the more toasted your bread gets. Sure, the hand sized opening is an accident waiting to happen, but that’s the price you pay for happy toast. Employing a similar principle to the Hood Toaster, the Glide Toaster gives bread a little bit of a ride, in this case by rolling it through an upright post with heating elements inside. In effect, it’s a toastjet printer: put in a blank piece of bread, push the button, and the Glide ekes out a piece of toast, no ink or toner required. It’s even got a handy little catch tray on the other side. In the 2.0 version, look for a “scan and copy” feature that’ll let you take a perfect piece of toast and duplicate it as many times as you want. Speaking of toastjet printers (a term which I have herein trademarked, by the way), here’s an actual one: the Zuse. It uses dot-matrix style heating elements to burn images at a resolution of 12×12 ‘pixels’ into toast. Remember dot-matrix printers? The ones that would “brrzzzzap” back and forth as they printed your text dot by dot? Yeah, those were the days. 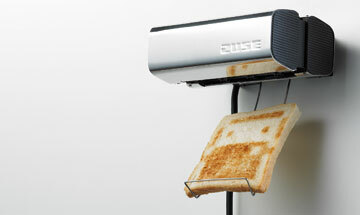 If we follow the trend to its logical conclusion, sooner or later we’re going to see laser toasters! At the moment there only seems to be one Zuse, but since it keeps turning up at design shows, there may be some hope for production. Alright, so you can’t actually buy a toastjet printer (yet). But we both know that if you did have a toastjet, all you’d want to print out would be pirate stuff anyway. So let’s skip all the ballyhoo and just get ourselves this jolly rodger toaster which is currently available for only 45 bucks. Pirates are awesome, ’nuff said. What is the single most serious problem facing toast production in the world today? That’s right: doneness. Whether it be overtoasting or undertoasting, improper thermotemporal management is an issue that should not be underestimated. 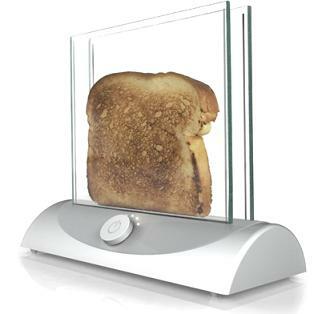 The Transparent Toaster has the potential to alleviate the agony of dissatisfied toast consumers around the world by allowing you to watch the development of your toast and select the ideal toast point (as it were). Currently, the heated glass doesn’t get quite hot enough to actually toast the bread inside, but I’ll sleep a little better just knowing that it’s being worked on. Oh and by the way, the flavor of toast is different from the flavor of bread because starch in the bread is converted to dextrose (a sugar) through heat exposure. Erm, I like the see through toaster most. Just thought you might like to know…..
Toast tastes different to bread cos the starch in the bread caramelizes with the heat and turns to sugar giving a richer taste. that’s not actually true. Toast will have the same calorie count, if not a minuscule amount less. Toast tastes different due to the “Maillard browning reaction”, where the carbohydrates present in the starch and sugar reacts with the protein in the wheat under high heat to give a characteristic brown color and “burnt” taste. It doesn’t magically extract sugar from the air and inject it into the toast, it just uses what’s already there…and yes, I went to toast college. I want to go to Toast College! 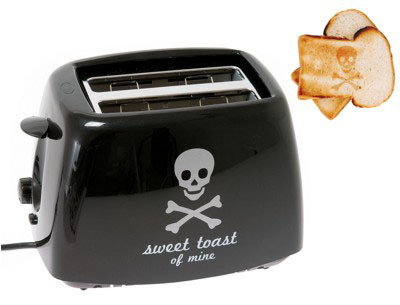 Where is the pirate toaster available for $45 USD and IN the US?? ?